Bunnies are hopping, birds are chirping, and the sun is waking up from a long winter nap. Yes, springtime is among us friends and boy does it feel good! 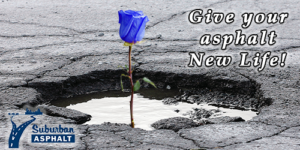 With so many signs of new life in the air, spring is the perfect time to breathe new life into old things, particularly your asphalt pavement. A popular method for rejuvenating an asphalt pavement surface is referred to as resurfacing. The method’s name actually describes the steps taken to pull a driving surface out of hibernation. In this procedure a machine known as a Mill grinds the top layer (or surface) off. After the top layer is removed, the binder (lower layer) is inspected to see if additional repair is required. Then, an adhesive, known as tack, is spread evenly on the lower layer. This is done to help the new layer “stick” to the existing surface. Once ready, the new surface is paved adding new life to a pavement surface. What are the benefits of resurfacing? -Resurfacing saves on repair cost when compared to removal and replacement. Costs are approximately cut in half on most projects. -An asphalt resurfacing saves time! In most cases, the downtime associated is very minimal. This is because there isn’t any grading or earthwork required. Phases of a resurfacing project are; milling, paving, and striping. -The risk for undercuts due to unstable sub grade is limited during an asphalt resurface because the underlying sub base remains covered. While it is possible to have binder (lower layer) repairs during this procedure, the risk to large additional costs are held in check. In most cases, the price quoted is the price invoiced during an asphalt resurfacing. What are the drawbacks of an asphalt resurface? -The main reason to avoid performing an asphalt resurface is that the final product doesn’t last as long as a removal and replacement. The typical life cycle for this is 7-10 years as opposed to 15-20 years. This is because underlying unstable sub base issues aren’t addressed. -If drainage problems exist, an asphalt resurfacing would not be ideal because the grade is put back to its original elevation. A common mistake that’s made is referring to seal coating as resurfacing. Given the wide discrepancy on procedure it is hard to understand why these two methods are confused. The biggest similarity that binds these two together is the surface of an asphalt pavement is given new life, yet the degree of which varies. Seal Coating is the act of spraying an existing asphalt pavement with a black substance that essentially acts as heavy coated paint. During this method, it is common to fill the larger cracks with a rubber-like material in order to protect the sub base from water infiltration. What are the benefits of Seal Coating? – Seal coating’s biggest benefit is providing a facelift to an old asphalt surface. It can be thought of adding a new coat of paint to your home’s exterior. It can be an aesthetically pleasing sight for home and business owners alike. – During seal coating, crack filling is usually done which protects asphalt from water entering the sub base and creating potential problems. – Seal coating in comparison to asphalt repair is relatively inexpensive! What are the drawbacks of Seal Coating? – The largest drawback of seal coating is that it must be maintained. Once an asphalt pavement is seal-coated, it should be done every couple years. Otherwise, faded seal coat on an asphalt surface produces a less desired effect. – If significant repair is required, seal coating may be a wasted expense. While seal coating is aesthetically pleasing, it is important to prioritize putting repair ahead of seal coating. Whether resurfacing or seal coating, each option presents a way to rejuvenate an asphalt parking lot, road or driveway. If you are looking to breathe new life into your asphalt, perhaps one of these options will work for you?